Director: Abbas Kiarostami. Cast: Homayoun Ershadi, Abdolhossein Bagheri, Ali Moradi, Hossein Noori, Ahmad Ansari, Afshin Bakhtiari, Hamid Massomi. Screenplay: Abbas Kiarostami. Abbas Kiarostami's Taste of Cherry, co-winner of the 1997 Palme d'Or at Cannes, is a sublime and patient film, following what may well be the last few hours of a lonely man's life, refusing to give up on him even though he himself seems to have forsaken the whole world and most of the people in it. Kiarostami, who writes, directs, produces, and edits his own pictures, handles his profound material flawlessly, producing a film as challenging as its subject matter demands but as moving and accessible as any friend's or neighbor's despair. The movie belongs in that small class I would call perfect. The protagonist of Taste of Cherry is Badii (Homayoun Ershadi), whom we follow in the opening scenes as he drives alone in his Range Rover in and out of the streets of Teheran, Iran's capital. The city seems well-kept and lively, but hard times have hit many of the working classes, or perhaps, judging from the incongruous smiles of the unemployed men lining the urban roadways, they always live hand-to-mouth and are used to it. These men, sometimes alone and sometimes in small groups, approach Badii's car as he drives, invariably asking if he has any work to offer them. Badii rejects all of their solicitations, kindly but tersely, though his repeated weavings in and out of the city blocks and his continual pattern of slowing to examine the workers suggest clearly that he wants someone, or something. Soon Badii drives out of Teheran and into the surrounding land, a desert vista that is in some places quite beautiful and in others bleak and monotonous. Bridging this transition from the urban to the unpopulated are the recurring images of Badii's face, which betrays nothing specific of the man's thoughts but still reveals an unmistakable sadness. 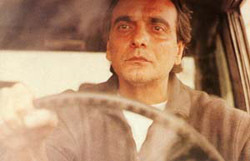 Plus, the fact that several passages take the shape of simple alternations between the desert landscape and Homayoun Ershadi's face makes it almost impossible not to associate the images: without stylizing the Iranian backdrop for any easy effects, Kiarostami still enables us read its windswept, desolate qualities within the rueful self-composure of Badii. Like other directors who rely mostly on non-professionals (Bresson, De Sica, and Dumont leap to mind), Kiarostami seems to have cast his actors partly on the basis of their quietly evocative faces, and partly for the vague desperation, likely born out of sheer, self-conscious inexperience, that most of them show on camera. This is one way, anyway, to try to account for the quiet, almost paralyzed nervousness that is afoot throughout Taste of Cherry, even despite the picture's tonal serenity. The movie repeats the same scenes and images quite often, but instead of boring us, it somehow manages to awaken both empathy and an extremely subtle anxiety. Badii's face and his wandering vehicle become extremely familiar without the film really divulging anything about them, and one has the sense, without the slightest whiff of suspense or even of plot, that the first change in the film's narrative or visual pattern is bound to be decisive. This intuition persists and grows as Badii picks up a young soldier (Ali Moradi) from the roadside and offers him a ride back to base. Rather than taking him straight home, however, Badii begins driving the long circle up a nearby mountain, engaging the younger man in the same sort of Socratic question-and-answer exchange which earlier characters, who refused Badii's invitations to enter his vehicle, found so angering or unsettling. The film suggests several possibilities for what Badii is up tois this a kidnapping? A sexual pick-up? The answer, ultimately, is both simpler and more profound: Badii has decided to kill himself, but he needs someone to shovel the dirt back on top of him once he has climbed into his pre-made grave at the top of the mountain. He offers a great deal of cash for the service, and his only other stipulation is that his assistant must return the following morning to check if Badii has in fact died, or to help him out of the hole if he survives. Suicide, we might well recall, is an even greater taboo in Islamic law and culture than it is in Christian scripture. Indeed, the very notion of taking one's own life is so venal to Moslem sensibilities that Iran nearly refused to let Taste of Cherry or its director leave the country. Faced with his countrymen's contempt for his proposals, Badii offers his prospective assistants a whole gamut of rationalized enticements, ranging from the philosophical ("All work is the same, a job is a job") to the pathetically humorous ("Just pretend you're farming"). After alienating the solider, Badii will have his most important exchanges with a seminarian and a taxidermist. His conversation partners often suggest an allegorical reading of Taste of Cherry. What, the film seems to ask, do the military, the church, and the scientific establishment have to offer to pained, struggling citizens? At the same time, the experience of watching Taste of Cherry is much less schematic than it reads on paper, and the humble visual style and carefully muted tone give the film a mundane quality that intriguingly tempers the high stakes of Badii's plan. Death is a momentous and even ponderous subject, for the characters and for the film itself, but it is also an irritating errand, because even in a lonely world, you need help in order to die. In fact, rather cleverly, Badii seems to use his own suicidal plan as a bridge to other people, drawing out their feelings and their arguments, learning in the process what separates the young from the old, the moralist from the free-thinker, the interventionist and the empath. The film, certainly, is intrigued by these questions, though its visual conservatism winds up functioning as a great, simple equalizerframing all its characters in the identical bounds of the car window, following Badii's Range Rover over the same pathways and around most of the same turns. Invited into this car, if not trapped inside it, and faced with such a stark proposal, none of the secondary characters has anything to rely on except their own moral sense and their own reason, and so we (and Badii) get to know them in a way that more expository, plot-centered movies rarely allow. Taste of Cherry, then, achieves a remarkable empathy with its characters, even as the film and its protagonist question the very possibility of empathy. "You can't feel what I feel," Badii says to one presumptuous interlocutor, and his retort seems as general as it is specific. As in Camus' The Stranger, Badii may be suicidal out of a belief that people are so disconnected and so permanently isolated that life has no meaning. Then again, there may be more immediate reasons; Badii occasionally alludes to a son, whom we gather to be either sick or deceased. When Badii does eventually find a half-willing accomplice, the fact that this man, too, has an ailing child seems to secure his reluctant agreement; that shared sorrow is the best pretext for human connection is not a spirit-lifting notion. But again, without resorting to the slightest sentimentality, the film is less interested in the reasons for choosing death than in those for choosing life. It is also laudably willing to take the problem of human sorrow for granted. By withholding the details of Badii's backstory, Kiarostami nimbly escapes the gross tendency of some movies to front-load a "sufficient" reason for a character's anguish, euphoria, what have you; this, of course, is an essentially moralizing approach, assuming that a case needs to be made for why a character should feel as he or she does. By contrast, Badii's sadness in Taste of Cherry deserves our compassion regardless of its source, though this does not mean that Kiarostami faults the characters who cannot do what Badii asks of them; empathy is not equal to obligation. If all of this sounds hopelessly talky or stifling, I am misrepresenting both the persistent quiet of Taste of Cherry and the visual eloquence of the picture, which perfectly complement its various theological, emotional, and philosophical questions. One shot, for example, is taken from the bottom of a desert hillside where Badii has briefly parked his car. He looks up and sees at the very crest of the uprise a bulldozer, which deposits a swirl of dust into the air. The extreme low angle of the shot makes the dust, which shines and curlicues beautifully in the sun, seem to spill from the sky itself, like a heavenly emission. It's a quietly rapturous moment, and yet also, given the image of dirt and dust being dumped on Badii from above, the shot is a clear metaphor for Badii's own suicidal plan. Images like these are arresting in their very prosaicness, fusing the beauty and morbidity of the movie, making of them a fruitful and complicated pair even though the moment doesn't call attention to itself in any conspicuous way. This gift for low-key, even subliminal suggestion is part of why Kiarostami is able to create such strong identification with such an aloof protagonist, and how the film as a whole manages to give rise to all kinds of philosophical inquiry without deviating from its remarkably concise conception.